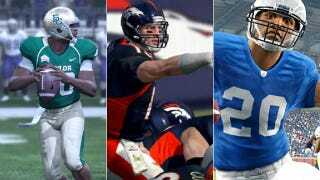 Four teams of all-star competitors, including three Heisman Trophy winners (in their video game personae, above) and two Pro Football Hall of Famers, clash tonight in the Madden Bowl, the annual pre-Super Bowl throwdown EA Sports has staged for nearly 20 years. You can watch the action on ESPN3, which means if you have an Xbox 360, you can probably watch it on that. Yes, viewing ESPN content on the 360 depends upon a Xbox Live Gold subscription. Not this weekend, it doesn't. Xbox Live just announced a free gold weekend, beginning tonight. Your internet service provider still must be subscribed to ESPN, which is a whole other kettle of fish. If you can't watch Madden Bowl XVIII on the Xbox 360, you can view it on the event's Facebook webcast page. Festivities begin at 7 p.m. EST with a "Blue Carpet" walk-in (the event is being held at the "Bud Light Hotel") with a four-team celebrity tournament getting underway shortly thereafter. Madden Bowl XVIII will be contested in Madden NFL 12's 3-on-3 Online Team Play mode. • The All-Madden Team: Current NFL stars. Running backs Arian Foster (Houston) and Maurice-Jones Drew (Jacksonville) joined by linebacker Patrick Willis of the San Francisco 49ers. • The Madden Legends: Hall-of-Famers Barry Sanders and Deion Sanders team up with future hall-of-famer and NFL Network analyst Warren Sapp. • Madden's All-Clutch Team: The Saints' Drew Brees and Jimmy Graham, joined by Denver quarterback Tim Tebow. • The Rookies: Three players likely to be first-round selections in the 2012 draft, led by 2011 Heisman Trophy winner Robert Griffin III of Baylor, with all-American running back LaMichael James of Oregon, and Fiesta Bowl MVP Justin Blackmon of Oklahoma State. Following the tournament, The Roots and hip-hop superstar Nas highlight an afterparty performance EA Sports is hosting only on the Facebook page. It begins at 11 p.m.